Forest owners and many other industry participants are lamenting the increased volatility of the log market this year. Already, with still a quarter of the year to run, the export log market has had two significant downturns. This plays havoc with planning and contractor livelihoods. It also begs the question of how New Zealand Inc. can build a viable, well-trained and well-equipped infrastructure to harvest the additional 10-15 million m3/annum of logs available over the next 10 or so years. There is little good news forthcoming on the export log market front this month. China continues to dominate the market. The weakness is still directly influenced by high log inventories in China and weaker log consumption. But, in addition, a more negative outlook of economic growth, the Chinese share market rout, sudden currency devaluation and weaker growth forecasts are all adversely affecting sentiment. The lower than prior forecast growth is having a negative impact on most commodities including logs and lumber. Log inventories in China, however, have fallen and are reported to be below 3.5 million m3 – a decent reduction from the recent peak of 4.0 million a month ago. The inventory reduction is due to reduced supply rather than increased demand. The run rate of deliveries from North America currently is reported to be less than half that of the period Jan-Jun 2015. 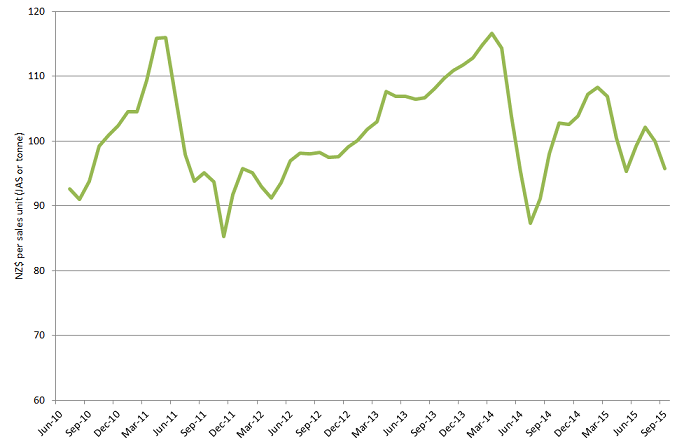 New Zealand supply volumes have taken longer to decline with relatively high volumes shipped in June/July. Log demand in China is lower than historically at this time of year. This is largely due to demand in South China being about 25% lower due to the forced relocation of plywood mills in Zhangzhou. As the relocation programme progresses, demand is expected to resume to similar to prior levels. The price discount for Radiata pine compared to U.S. Hemlock/D fir in China has increased from US$10-15/m3 to US$25/m3 suggesting NZ marketers have been weak sellers, or perhaps reflecting the lower supply elasticity for Radiata pine from New Zealand. The NZ$ has continued to weaken against the US$ and has helped to soften the falling US$ CFR sales prices. Ocean freights rates have been steady at historically low levels and bunkers (fuel used in log vessels) have also been falling along with weakening crude oil prices. The favourable exchange rate movements and shipping costs will help support log prices in New Zealand. Whilst other markets such as India and Korea have been offering up some higher at-wharf-gate log prices at some ports, significant prices reductions in these markets have also occurred. Pruned and unpruned, structural domestic log markets continue to be strong and are expected to pick up pace this summer on the back of strong new dwelling consents. Unpruned, non-structural log processors are facing weaker Asian demand and prices for industrial lumber although the lower NZ$ is providing some favourable offset. The PF Olsen log price index fell four points from $100 last month to $96 this month. It is now $11 higher than its cyclical low of $85 in November 2011 and $8 below the two-year average and $6 below the five-year average. As reported last month, the index is being supported by higher-than-usual pruned log prices (both domestic and export), and domestic structural log market strength. Whilst it's difficult to call, September does feel like a market trough. 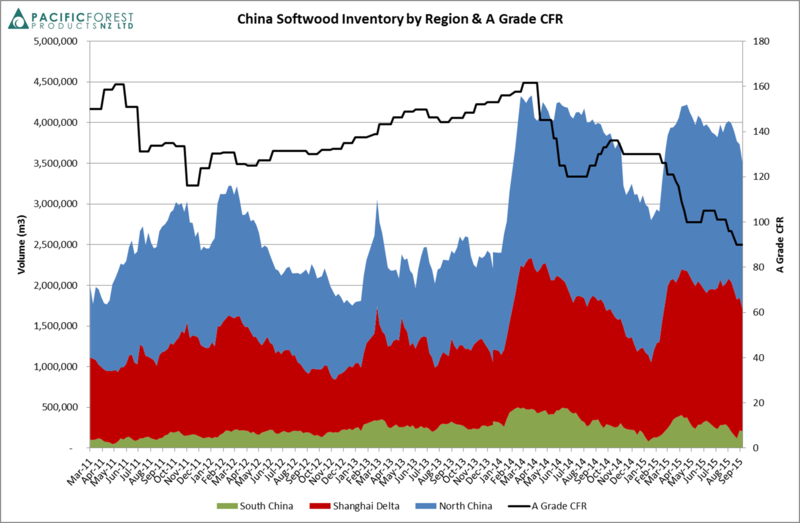 Meaningful reductions in log inventory in China, along with big reductions in supply from North America and a lift in Chinese demand (as relocated plymills in South China come back on stream) all point to a lift in CFR price from current historic lows. The lower NZ$ is supportive of at-wharf-gate price, as are the steady log vessel charter rates and downward trend in bunkers. Domestic log demand is expected to stay strong, and pruned log prices could well rise from current high levels. PF Olsen is negotiating a number of fixed price arrangements with log exporters to try to reduce the damaging log price volatility for forest owners and contractors. These prices are at a premium to the current market price, indicating that the market has bottomed. Further out, the strength of the recovering housing market in China will determine prices for utility logs. The key question here is whether new housing sales will be sufficient to clear enough inventory from developer's books to encourage them to mobilise their land banks and start a modest, new building cycle.